Mac Custom Cattle Feeding with the Customer in Mind! The Bezner family is working on its fourth generation involved in production agriculture and cattle feeding. We are well diversified, from our cow-calf operation, to irrigated corn and wheat production, stockering, backgrounding, and cattle feeding. We are located on the High Plains in the northwestern corner of the Texas panhandle. Our climate is arid and very nearly the optimum climate in the United States for feeding cattle. To further compliment our production system we built the feedyard in the summer/fall of 1997. We had the incredible luxury of starting with an open field for our drawing board. We implemented our design with one simple premise. 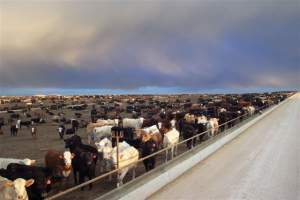 Construct a feedyard that would be the most efficient feedyard ever built. We focused on animal care and handling, feed production and delivery. Everything in our design had something to do with adding efficiency and profitability to every animal fed at Bezner Beef. Bezner Beef also buys quality feeder cattle. If your interested just fill out the information and one of our representatives will contact you.